Pets have so much love and affection to offer and who better to receive such love than senior citizens? There are several great benefits that come with owning a pet. From a lower blood pressure, better health, and a happier psyche, the benefits are guaranteed to bring a smile to seniors. Many seniors don’t have as much responsibility as they used to. As their children and grandchildren age, the responsibilities of raising and taking care of them decreases. This can cause seniors to feel as though they have a lack of purpose. However, pets require a lot of attention. Just like children, they need to be fed, loved and cared for. Thus, by watching over a furry companion, seniors can have a new sense of fulfillment and responsibility. Friends and family have a tendency to move around and they are not always close by. When seniors own a pet, they have a companion to talk to and spend time with. Having a pet also provides seniors an opportunity to make new friends. Pets are a fantastic conversation starter when meeting new people. In a study conducted by the American Heart Association, out of “more than 5,200 adults, dog owners engaged in more walking and physical activity than non-dog owners, and were 54 percent more likely to get the recommended level of physical activity”. Not only is owning a pet beneficial to seniors, but it’s good for the pet too! Pets rely on their owners for exercise, but unlike their owner, they can’t do it alone. Whether someone walks with a pet or plays with it at home, it is essential for the pet to exercise regularly in order to increase its longevity. Whether pets are making noise or attack when an intruder enters, they’re essentially a state-of-the-art security system. Burglars are less likely to break into a home if they know a dog resides there. Additionally, pets can act as an alarm system if a senior falls or becomes ill and can potentially save a life. Good eats. Pet diets are extremely important to keep an eye on. Some breeds need more food than others and some need less. To ensure that a pet is getting the correct amount and type of food, it is important to ask a vet. Signs of affection. Table scraps are not meant for pets and can be a leading cause of a pet’s obesity or illness. Another factor leading to obesity may be the number of treats owners give to their pets. Rewarding a pet for accomplishing a task or showing love is not a bad thing, as long as it is given in moderation. Read labels. Check the food labels. What are the ingredients? How many calories are there? Are there any processed chemicals or preservatives? It is important to give pets more of the healthy nutrition they need and less of the fats and fillers commonly found in pet food. 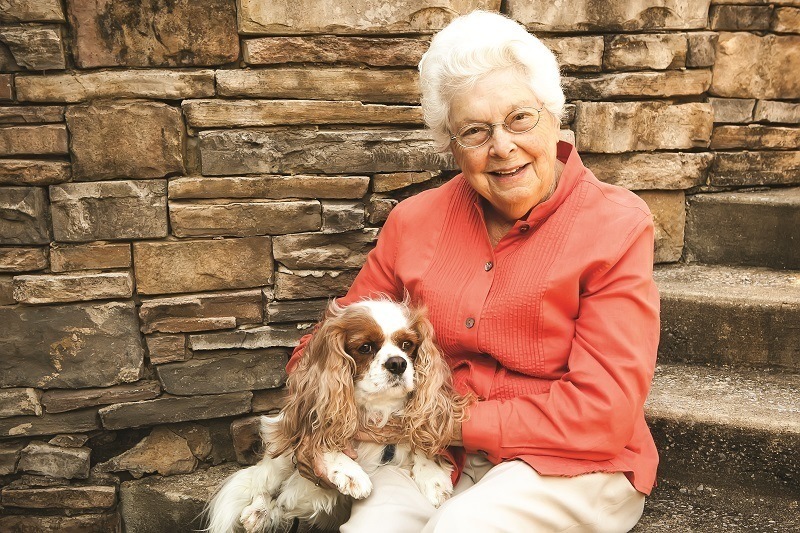 Pets are welcomed at Discovery Village Senior Living communities with smiles and belly rubs (for the pet). Discovery Village team members are prepared to help residents take care of their pets’ daily needs, as well as help the residents with any additional care that is required. Our team knows that residents’ pets are part of their family, and at Discovery Village, we always make pets part of our family as well.